A series of studies conducted by psychologists at the University of California, Berkeley and the University of Toronto in Canada reveal something the well off may not want to hear. Individuals who are relatively high in social class are more likely to engage in a variety of unethical behaviors. 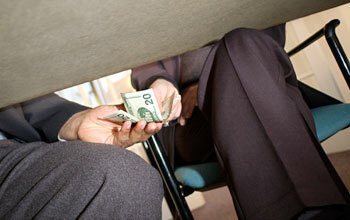 Researchers: Upper-class individuals more likely to engage in unethical behaviors. That is the finding of new research published in today’s Proceedings of the National Academy of Sciences and it’s a doozy. “Our studies suggest that more positive attitudes toward greed and the pursuit of self-interest among upper-class individuals, in part, drive their tendencies toward increased unethical behavior,” said lead researcher Paul Piff of UC Berkeley. The research revealed that relative to the lower class, upper-class individuals are more likely to break the law while driving, more likely to exhibit unethical decision-making tendencies, more likely to take valued goods from others, more likely to lie in a negotiation, more likely to cheat to increase their chances of winning a prize and more likely to endorse unethical behavior at work. “The relative privilege and security enjoyed by upper-class individuals give rise to independence from others and a prioritization of the self and one’s own welfare over the welfare of others–what we call ‘greed,'” explained Piff, whose research was funded in part by a National Science Foundation Graduate Research Fellowship. “This is likely to cause someone to be more inclined to break the rules in his or her favor, or to perceive themselves as, in a sense, being ‘above the law,'” he said and therefore become more prone to committing unethical behavior. Piff and colleagues conducted seven survey, experimental and naturalistic studies to determine which social class is more likely to behave in unethical ways–to engage in behaviors that have important consequences for society such as cheating, deception or breaking the law. Piff and his team found drivers of higher-end automobiles were four times more likely to cut off other vehicles before waiting their turn at a busy, four-way intersection with stop signs on all sides. In addition, they found upper-class drivers were significantly more likely to drive through a crosswalk without yielding to a waiting pedestrian. For these studies, the researchers defined social class by an observable cultural symbol of social class–namely, the car one drives. In another laboratory study more directly related to greed, researchers found upper-class individuals were more likely to cheat in a game to improve their chances of winning a cash prize. In this study, Piff and colleagues measured social class using the MacArthur scale of subjective socioeconomic status, where participants rank themselves on a 10-rung ladder relative to others in society in terms of their wealth, education and the prestige of their jobs. Participants then played a “game of chance” in which a computer “randomly” presented them with one side of a six-sided die on five separate rolls. Researchers told participants higher rolls would increase their chances of winning a cash prize and were asked to report their total score at the end of the game. In fact, die rolls were pre-determined to sum up to 12. The extent to which participants reported a total exceeding 12 served as a direct behavioral measure of cheating. Greed “is a robust determinant of unethical behavior,” the researchers write in the report. “Plato and Aristotle deemed greed to be at the root of personal immorality, arguing that greed drives desires for material gain at the expense of ethical standards.” For this study, the researchers conclude that, in part, due to their more favorable beliefs about greed, upper-class individuals are more willing to deceive and cheat others for personal gain. “Study 4 is also intriguing,” said Piff. Study 4 sought to provide experimental evidence that the experience of higher social class has a causal effect on unethical decision-making and behavior. It was the only study in which researchers manipulated participants into temporarily feeling either higher or lower in social class rank to test whether these feelings actually caused people to behave more or less unethically. At the end of the study, the experimenter presented participants with a jar of individually wrapped candies, ostensibly for children in a nearby laboratory, but informed them that they could take some if they wanted. This task served as a measure of unethical behavior because taking candy would reduce the amount that would otherwise be given to children. People in this study, who were made to feel higher in social class rank, took approximately two times as much candy from children than did people who were made to feel lower in social class rank. “Across all seven studies, the general pattern we find is that as a person’s social class increases, his or her tendency to behave unethically also increases,” said Piff. Joining Piff in the research were Daniel M. Stancato, Rodolfo Mendoza-Denton and Dacher Keltner of UC Berkeley and Stéphane Côté of the University of Toronto.